After the successful closing of the 1st phase of the construction project (project 54 A) all the foundations are foreseen for the main buildings (classes, dormitories, refectory and kitchen, office and physiotherapy room) and the walls for the 3 classes and the refectory and kitchen are finalised till above the windows. The construction works in the centre started in June 2014. This construction project is being realized with the financial support of our partner Vleugels Van Hoop. This huge plan will, after alignment with our partner, be realized in several phases. The current report concerns the progress of the activities in the period from end of January to beginning of March 2015. The funds for the 2nd phase were available end of January 2015. The construction works were continued (see table below). Rwanda Energy Group – REG, responsible for the distribution, made an offer already. As other persons are waiting for connection we’re in a contact phase related to a split of costs. Delay in supplying bricks: the supplier informed us about a changed technology of baking the bricks: instead of using wood now sawdust and rice bans are used; this according recommendations/requirements of the National Agency of Environmental protection. They guarantee that the normal production rhythm will be picked up again from mid of March. 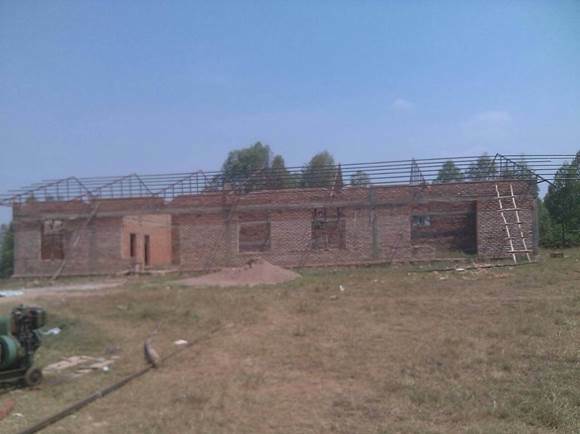 The unpredictable time needed to get connection to the electricity net: as the roof will be supported by a metal construction, electricity is a necessity. The National Agency responsible for the distribution of electricity (Rwanda Energy Group – REG) can’t give us a precise data for the connection … they informed us we have to be patient! In general the progress is not as expected because of above mentioned reasons. 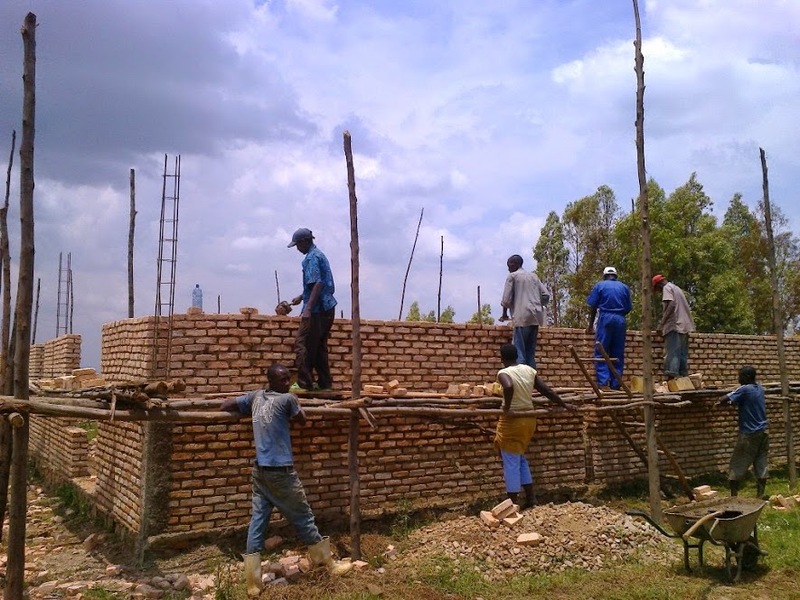 On top of that the long rain season starts in April; therefore we’re going to increase the rhythm of the activities in the remaining weeks of March (the first bricks are delivered by now). Related to the electricity connection we will put some pressure at the society and ask local authorities to negotiate for us. 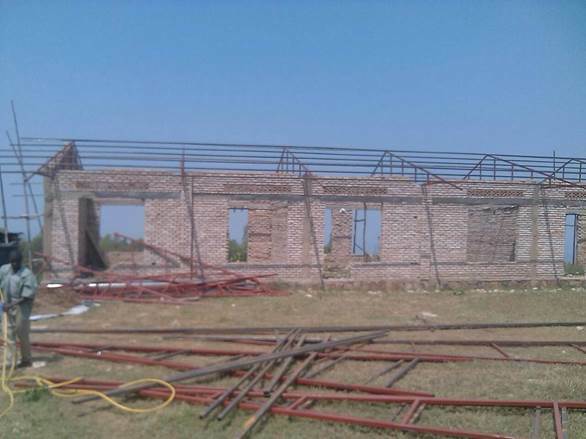 Since June 2014 Jya Mu Bandi Mwana is building a new centre for children and youngsters with a disability. This construction project became possible by the financial support of our partners, Vleugels van Hoop vzw. Together with our partner it was agreed to execute the project in different phases. This is a middle long-term project. This report is about the activities performed up till end of May 205. The uncontrolled time needed for the connection to the electricity net: 'Rwanda Energy Group - REG' is very unclear related to the connection. According to the latest information, provided by the responsible person for this area, this will take place in the beginning of June. We underestimated this part! Our technician assumed we could share the costs with our neighbours, but till today electricity is no priority for them. connect too, calculated their costs through. Delay in activities: This season we had exceptionally lot of rain; therefore we had to stop the works sometimes. As soon as we will be connected to the electricity net the construction of the roofs will start (probably beginning or mid of June). 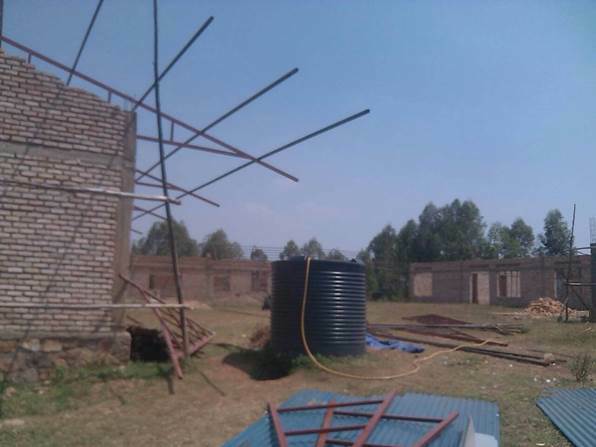 The construction of the dormitories goes further. The long dry season is starting in June which will make the construction activities a lot more easy. Dormitory 2 is build up to roof level. The timber works are executed with the help of a electricity generator. 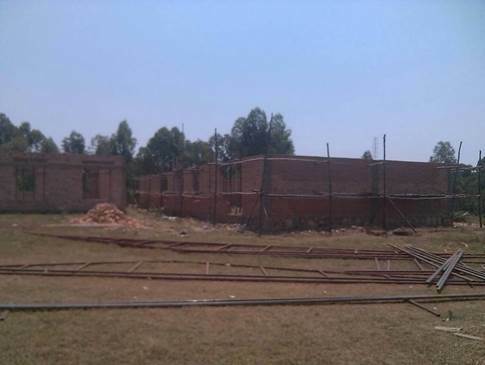 The contract with the supplier of the truss includes the finalization of the classrooms, the refectory and a dormitory. For the roof works we already ordered the tiles. 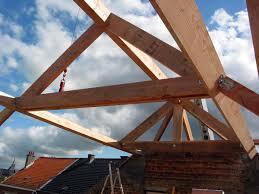 This work will start of the finalization of the truss. We will complete this 2nd phase with finalizing the timberworks (i.e. mid, latest end of August 2015). This way all building will be constructed except for the small administration building. The budget foreseen for this one is used in the negotiation to get electricity (too low budgeted in the start phase). Finishing activities (trim vertical walls, floors, paths, installation electricity, sanitary facilities and kitchen).